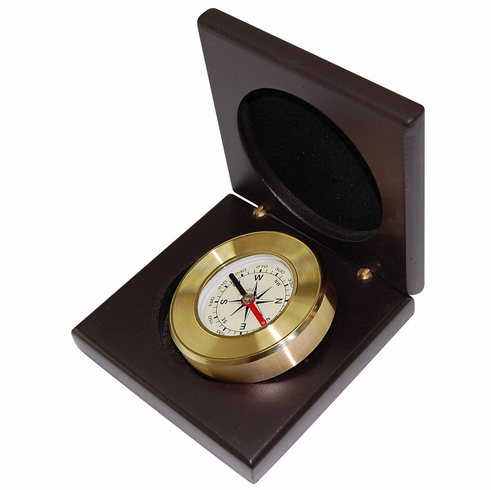 The Amalfi brass desk compass is the perfect business gift. Housed in a hinged wooden box, the removable brass compass features a felt back and makes a beautiful paperweight. The heavy-weighted AMALFI brass desk compass is the same size as the Eclipse desk compass and also features a liquid filled compass capsule, but the solid brass body and the wooden box are in stark contrast to the bright silver color of the Eclipse in the aluminum box. The tightly grooved surface of the AMALFI is not designed for engraving.